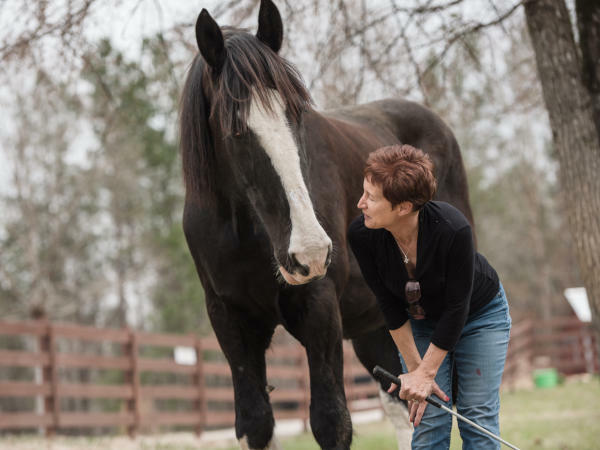 Leigh knew first-hand about a horse’s natural ability to help humans heal – she’s been a horse lover and equestrian most of her life. In fact, in addition to being a biologist and middle school teacher, she manages the couple’s 20-acre farm in Angier, replete with horses (of course), miniature donkeys, chickens, and dogs. Not surprisingly, both Gerald and Leigh also have a heart for rescued animals taking a huge leap of faith two years ago when they bought two Clydesdale horses destined for slaughter after a herd dispersal in Pennsylvania. “Both of the horses were in horrible shape,” says Leigh. Tessa, the older of the two, had been a brood mare and bore all the markings of being overbred and severely neglected. Over the next few years, as the horses recovered and learned to trust Leigh and Gerald, they noticed a distinct quality in Tessa’s persona. “She is a gentle soul who mothered the herd,” says Leigh. And, even though she stands 18 hands and towers over most horses, her instincts are quiet, calm and kind. Leigh knew in her gut that Tessa was meant for something more than just grazing and soothing her spirited pasture mate, Chloe. “I told our vet last summer how Tessa would be a wonderful therapy horse,” says Leigh. Kim shared the news with Gerald a few months later when he was at the ranch interviewing kids for a story on WRAL-TV. “Gerald understood all too well the incredible impact Abby had at Hope Reins,” says Kim. It’s easy to recognize God’s perfect timing in hindsight or after seemingly disparate sets of circumstance meld together and answer a long-held prayer. But sometimes, recognizing his workmanship in progress can be hard. “When Gerald mentioned Tessa as a potential horse for Hope Reins, I filed it away as an interesting but probably not plausible option,” says Kim. “A therapy horse requires some very unique characteristics, and I couldn’t imagine finding another draft like Abby so easily.” But when Gerald invited Kim and other staff members to meet Leigh and Tessa at their farm, they were quite astounded by what they found. Hope Reins and the Owens agreed to move Tessa to Hope Reins for a 90-day trial period to ensure she’d be a good fit for the program. Even though Tessa shares many of Abby’s amazing attributes – Elizabeth is quick to point out the new mare’s role at the ranch will be very different. “Abby was intensely relational and big on the outside, but her confidence was lacking on the inside. Tessa, on the other hand, is a confident leader, stable and secure inside and out,” she says. Tessa’s path to hope and healing has been a long and emotional experience for the Owens. Her departure from their farm is bittersweet for Leigh and Gerald, but knowing she’s going to be taken care of so well by so many is comforting to them. Editor’s Note: Tessa arrived at Hope Reins on March 8, and by all indications, is going to be a remarkable addition to the Hope Reins herd. Karen & Tessa getting to know each other. Karen will be Tessa’s new trainer.